A neuroma is a benign thickening of the connective tissue or sheath around the nerve. 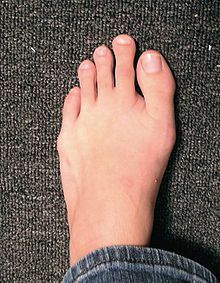 It commonly occurs in the 3rd interspace, betweent the 3rd and 4th toes. However, it can occur in other locations. The thickening of the nerve leads to irritaion which may cause perminant damage. The reason for development is unclear, but literature has related it to a person with a Morton's foot type. That is an individual with a short first metatarsal which then leads to overload of the lesser metatarsals. In addition, mechanical irritation and other forefoot pathologies like bunions and hammertoes have been atributed to the development of a neuroma. Most patients relate a burning type sensation or electrical sensation radiating out the toes. Others have described a numbness or sharp pain. It is often worse in shoes and partially relieved with removal of the shoes and rubbing of the foot. Still others relate the feeling as if they sock is balled up or something on the inside of their shoe. The symptoms are usually progressive in nature. Physical examination of the foot in addition to imaging can provide the correct diagnosis. Our office is equipped with real time diagnostic ultrasound which allows direct visualization of the neuroma. Not very often for our patients we have a very high success rate with conservative care. If surgery is needed it can be preformed in our ambulatory surgery center and takes only about 45 minutes. Case study, example of a recent patient. Recently we had a patient come to Issaquah Foot & Ankle Specialist with a 5 year history of neuroma pain. The patient had tried multiple conservative modalities including; physical therapy, NSAIDS, topical medications, orthotics and cortisone injections. The patient had been told the only recourse they had was surgical excision. I discussed with the patient our technique for using alcohol injections and we proceeded with the series of injections. They had a total of 5 injections and is now pain free and has returned to one of their favorite past times, walking . I will briefly discuss the use of alcohol injections for neuroma pain. The original article in foot and ankle journals describedthe use of 4% alcohol and required approximately 10 treatments. The success rate reported in the literature was 89%. We use approximately 25% alcohol and find we need to preform less treatments and have success that parallels the initial study.